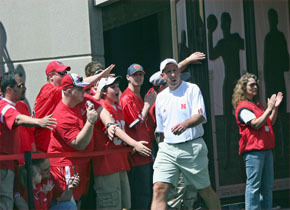 A record crowd of more than 80,000 was on hand for Head Coach Bo Pelini’s first Nebraska football spring game April 19 in Lincoln. There were also more than 250 former Husker players in attendance to watch the Reds defeat the Whites 24-14 in the annual finale to spring practice. For more photos from Saturday’s spring game, click Sports.